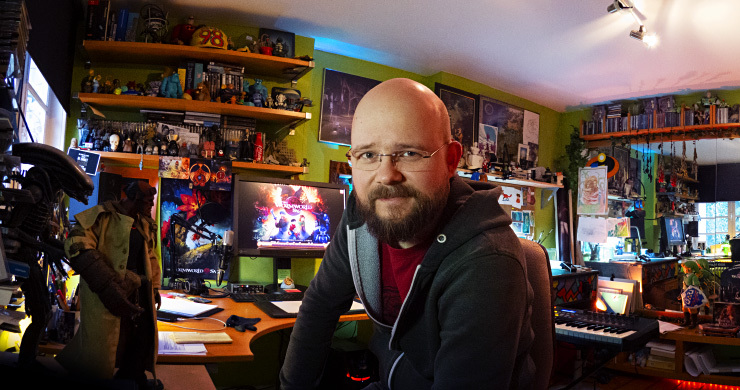 My name is Daniel Lieske and I'm living with my wife, two kids, and two cats in Germany, in a small town called Warendorf. I'm writing and illustrating The Wormworld Saga and I've actually started to create comics pretty early in my life. Throughout my school years I created all sorts of stories, and as a teenager I produced my own comic books on my father's xerox machine, and sold them in the school yard. If you ask me, I should have become a comic artist right after school, but since there is no such thing as a comic book industry here in Germany, I became a graphics artist in a computer games company instead. I did computer games work for over ten years and during that time I started to draw and paint digitally and also learned to use 3D software. These skills came in handy when my very own call to adventure turned me into a graphic novel author. It all kind of started with a painting that I created in 2006 called The Journey Begins. 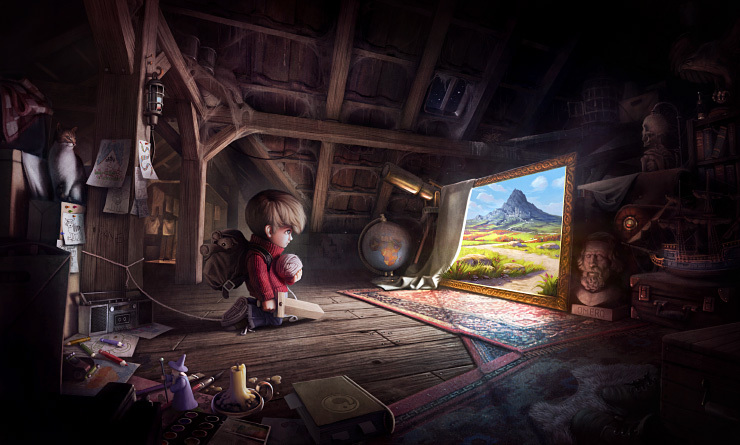 A young boy finds a magic painting that transports him into another world. This world already existed in my mind because I had toyed around with world building for several years without a specific goal in mind. The Journey Begins provided me with a protagonist and from that point on, things started to escalate in my head. And the painting had a second, very important, effect. It attracted people on the internet and raised interest in my work. I even started to sell prints of The Journey Begins to total strangers and suddenly I was that boy again, who sold copies of his own work. Only that the school yard had become a lot bigger this time. In the following years, the story in my head grew into an epic trilogy of three journeys into the Wormworld. I arrived at a point, where I knew that I had to publish this saga in some form or it would simply kill me. Not right on the spot, but slowly and painfully over time. I started to work on the graphic novel in 2010, and since my job didn't leave me with much free time, it took me the whole year to create the first chapter, which I was finally able to publish on Christmas Eve 2010. From that point on, it's all a big blur. The first chapter went viral, impressive amounts of people started to follow me, I got a son, crowdfunding campaigns provided budget to continue my work, book publishers offered contracts, I quit my job, I produced more chapters, more crowdfunding, more books, another son, more chapters, and... here we are. Every single bit of The Wormworld Saga graphic novel, that I managed to produce since the beginning in 2010, is published here on this website. You can follow my activities on the official Wormworld Saga Facebook Page, and on Twitter. New pages are posted there, too, and you're invited to leave me your comments. If you're very eager to follow me closely you may want to consider to support me on Patreon.com where I post exclusive production updates and other behind the scenes stuff. That way you can actively support the creation of the The Wormworld Saga and gain access to all the special content that you can find on this website. Plus, you'll always be 10 pages ahead of the public release. If you are interested in what I'm doing besides The Wormworld Saga, I'd like to invite you to visit daniellieske.com, a website featuring a lot of the artwork that I've created between 1999 and 2009. More recent artwork is frequently added to my Artstation Portfolio.